Join the discussion on our forums! Come discuss Unidentified Contract over in our dedicated Unidentified Contract discussion topic. So, you play Assassinate and one of 2-mana cards: Patient Assassin, Betrayal, Seance or get 2-mana from two The Coin. Not that bad, in my opinion. I would not place more than one copy in a deck though. I hope you have given a prize whom made desing of this card. It's very good, stylishly and i want to try it. But in general of all new Rogue cards, it's looks so so. Hope you apologized to the designer for this expansion. I did; we’re cool. They said they won’t make it awkward. 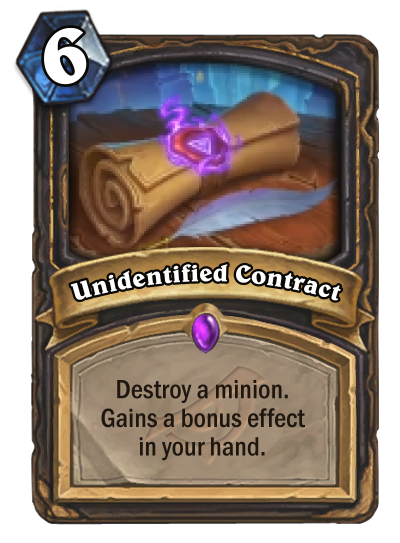 Expensive, but seems like it would be worth it to run one copy in most decks as a handy removal for any big scary minions. mind if i... have a look at those? just got one of these in a pack. going to try it in burgle. looks to be canny.